Books are wonderful companions for travelers, helping transport us to another land in person or spirit. Setting can be a key feature for some books, often performing as a character. Fiction and nonfiction can prepare readers for other cultures, adding special meaning to journeys that test our assumptions as readers: "writing images particular spaces onto the printed page, but just as writers invent places, readers are at the very least partners in the process of producing textual places," writes John Thieme in "Reading Places: The Geography of Literature," an essay that compares how R.K. Narayan and Amitav Ghosh handle cultural geography. Novels: On Location is the easiest and quickest site for posting location. 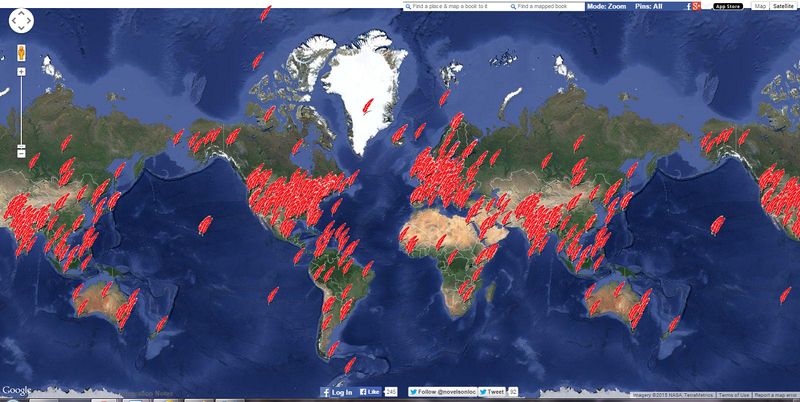 Users can search by location or by novel. Those who want to add a book can zoom in on an location, add a pin, and type in the name of the novel. The site pinpoints most novels automatically with a thumbnail of the cover and description, allowing immediate purchase from Amazon or iBooks. It took less than 5 minutes to place Fear of Beauty on top of Afghanistan and explain how the setting of Laashekoh is a fictional village in northern Helmand. There is also a Reader Notes section, to add descriptions or quotes from the book. Results are posted immediately. The setting for both novels is a fictional and remote village. 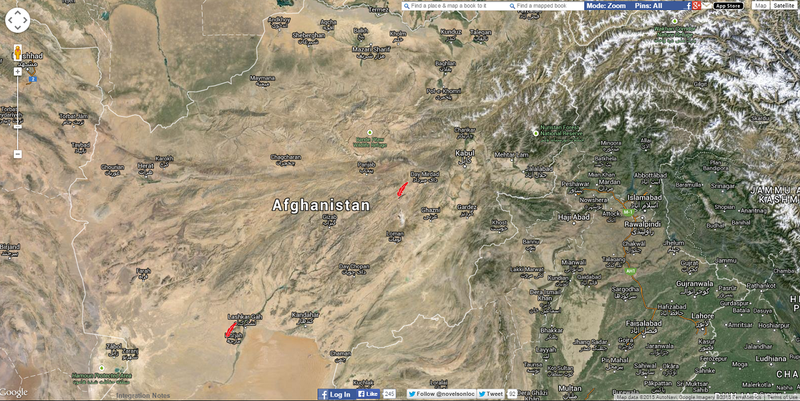 So I typed in "northern Helmand" as the location for both. 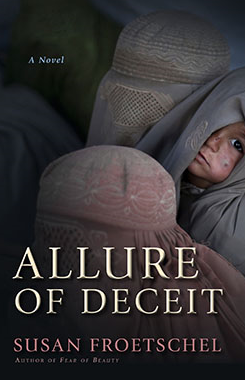 Fear of Beauty is shown north of the capital in another province and Allure of Deceit is south of the Helmand provincial capital. Because the village is fictional, I can understood the tool's confusion. Still, I agree with this self-assessment from the site's creators in the integration notes: "the Web's best way to find novels by setting. If you write a blog on literature, travel or, education, enhance the interactive experience for your readers by integrating Novels: On Location." Note of caution: Authors or readers may unintentionally inflate pin results by posting one book with more than one setting in multiple locations. 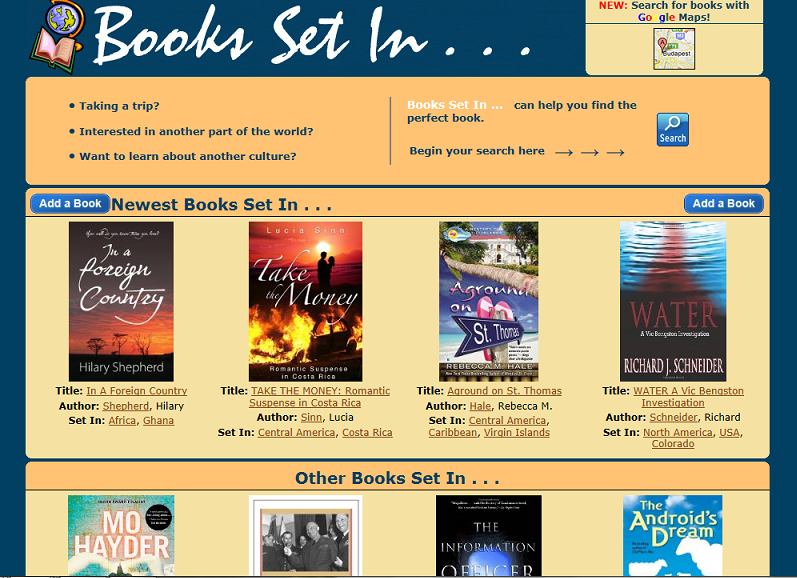 BooksSetIn relies on search engine methods and tabular results, with input provided by readers. This format accounts for both place and time. In searching for Helmand Province, one book emerges: Torn by David Massey, while a search for "Afghanistan" yields many more results. 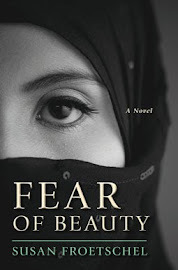 Again, it took less than 5 minutes to list the title, author, ISBN, and description for Fear of Beauty and Allure of Deceit. The site is inviting for travelers and readers both - and asks: "Taking a trip? Interested in another part of the world? Want to learn about another culture?" 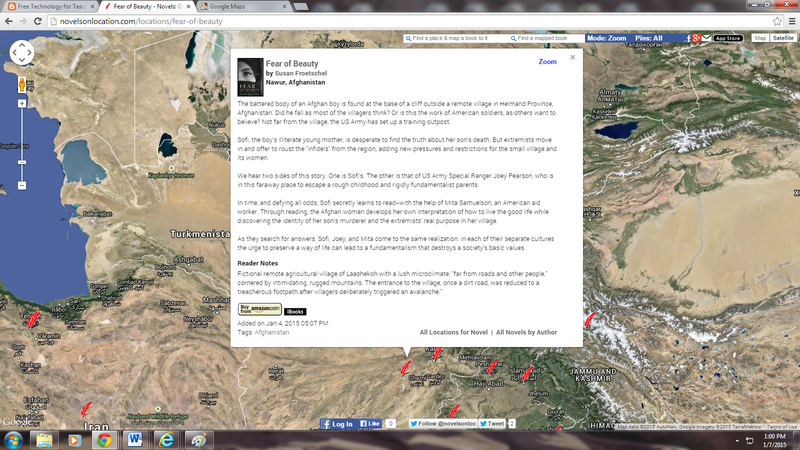 The tool easily permits multiple locations and also highlights a few places and books on its front page. Not much has been written about the site, but Facebook suggests it began in Pennsylvania. Book Drum, from London, is the most thorough, elegant and yet complicated of the sites, inviting authors and other registered users to submit detailed profiles on authors and settings as well as background and new explorations of specific quotes. A map is promised but did not show up on this user's multiple tries with browsers IE and Chrome (a message points out that Google has disabled its map tool for the application). Starting the profile is easy, logging on with Facebook, but some features such as adding coordinates or saving the page numbers for quotes do not run as smoothly. Books are not posted until all six sections are started. 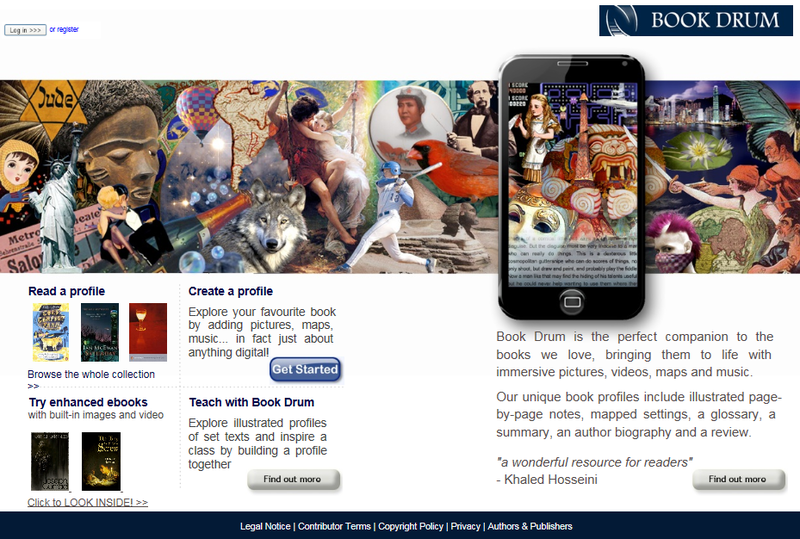 The site's self-assessment: "Book Drum is the perfect companion to the books we love, bringing them to life with immersive pictures, videos, maps and music." These websites are especially useful for countries and cities that are less common as literary settings. Cities like New York and London on these sites are teeming with books. That doesn't mean the smallest villages of the world are not teeming with stories. Most authors and readers have not caught on to these sites just yet, and an avalanche of interest could arrive any day.